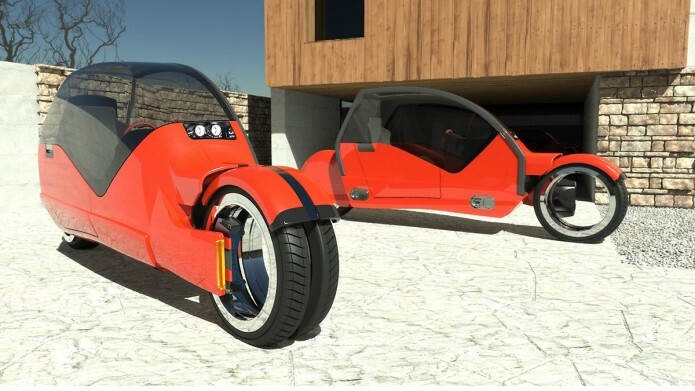 If you’ve ever dreamed of pretending you’re Batman and splitting your car off into a functional motorcycle, that dream has just gotten a little more real. It’s a concept called the Lane Splitter, and when assembled together it functions as a car. When a couple people need to use it, however, it splits into two motorcycles, giving one a way to let their hair down when appropriate and to avoid the rain those other times. Unfortunately, however, it remains only a fanciful concept at this point. The Lane Splitter features two rear wheels and two front wheels, as well as a hatch that lifts upward for the passengers to enter. There are two seats and two steering wheels, which is expected given that it is to operate as two separate motorcycles. The total vehicle measures in at 128-inches in length, and is intentionally asymmetrical. As you can see in the picture below, the front wheel on the bikes — when in motorcycle mode — splits a little bit into two smaller wheels, which makes the bike a little more stable. The wheels come together when the bikes are assembled back together into a single car. The power goes to the rear wheel, meanwhile, with each section having its own electric motor.